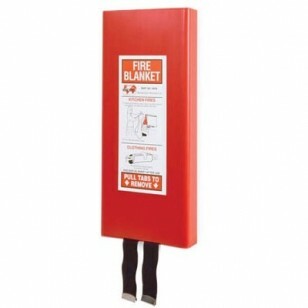 Fire blankets are an effective way to smoother and extinguish fires. This fire blanket is constructed of a 3-ply material: two layers of woven glass fiber and one inner layer of fire retardant film. Packed in a highly visible red slim line wall cabinet with easy to follow pictographic instructions. Simply pull the straps at the bottom of the cabinet to remove. These fire blankets are designed for one time use only. Ideal for smothering and extinguishing fires in offices, factories, laboratories, hospitals, schools, homes and kitchens. Independently tested BS6575: 1985.